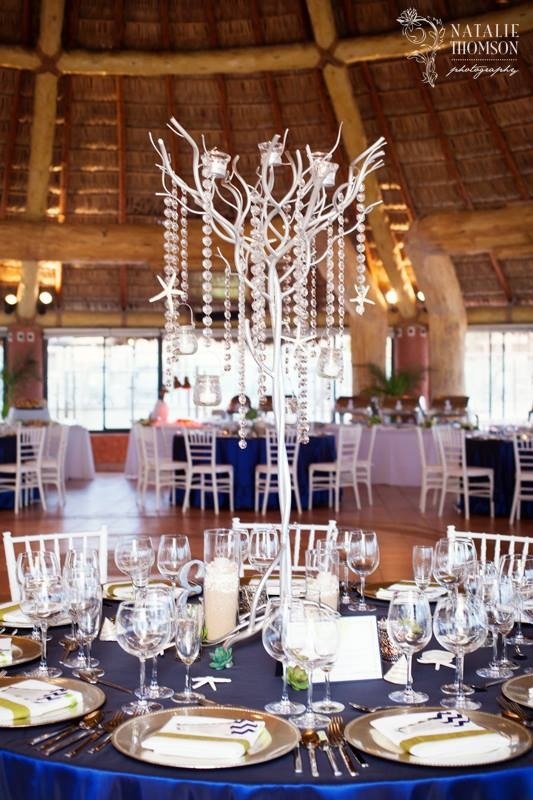 This week’s bright, stylish wedding décor at the Sandos Finisterra Los Cabos is a perfect example of how our designers can work with any budget to produce exactly the look you have in mind for your destination wedding! Bride Sarah wanted wedding and reception décor that was both unique and cost-efficient. Our décor designers took her vision of vibrant, sophisticated décor and created this fun navy and green collection that turned out just as lovely as we imagined! One way we were able to keep the costs reasonable for Sarah’s décor was to use a few of the bridesmaid bouquets on the tables—this added a hint of bright green that really helped the table décor stand out. We also followed the bride’s wish to use only candles and crystal trees as centerpiece décor, which created a truly unique look everyone loved! Sarah’s Sandos Finisterra wedding was held in June, which is a great time of year for events at this resort. We love how many great spaces are available at this property for ceremony, cocktail and reception, and the air-conditioned indoor palapa area is perfect during Cabo’s warm summers. 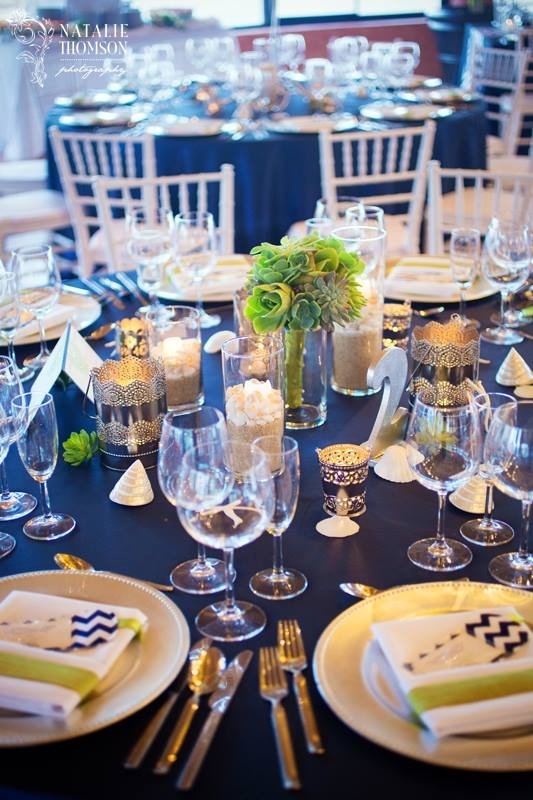 The Sandos Finisterra is the only all-inclusive resort so close to downtown Cabo San Lucas—with views of both the marina and the Pacific Ocean, we highly recommend this venue for your Cabo wedding or special event! This entry was posted in Weddings and corporate events decor and tagged BEACH WEDDING DECOR, blue and navy wedding decor, bright Mexico wedding, bright wedding colors, Cabo beach wedding, Cabo wedding decor, destination wedding decor, event decor in Cabo, event design in Cabo, linens rental in Cabo, LOS CABOS WEDDING, Mexico wedding decor, navy blue wedding, Sandos Finisterra all inclusive, Sandos Finisterra beach wedding, Sandos Finisterra Cabo, Sandos Finisterra Cabo wedding, succulent, wedding rentals Cabo, wedding vendors Cabo.